We are excited to launch a recognition program that honors the most engaged developers and contributors in the community. 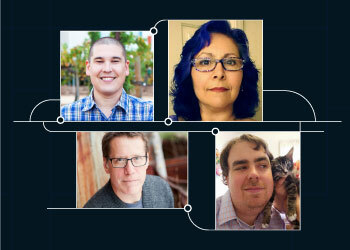 These individuals are educating and inspiring other developers in the community online and offline. They are actively and independently sharing their passion and knowledge of Alexa with the community. We’re proud to call them our “Alexa Champions”. Today we recognize the initial group of ten Alexa Champions and showcase their contributions to the Alexa community in a dedicated gallery. We thank them for all the knowledge they have shared with others and for the tools they have created to make it easier for developers to use the Alexa Skills Kit (ASK) and Alexa Voice Service (AVS). April Hamilton was one of the first developers to join the private beta of the Alexa Skills Kit and to get skills certified in 2015. She curates the LoveMyEcho.com blog daily and shares tips and tricks with developers in her weekly ASK Dev Tuesday series. Learn more about April. Brian Donohue started a local meetup group for Alexa enthusiasts and developers in New York which now counts over 400 members. For the first event, he created a “Hello world” template to show attendees how to build their first Alexa skill. Learn more about Brian. Eric Olson a.k.a. Galactoise is one of the most active contributors in the Alexa forums with over 280 reputation points. He co-created the Alexa Skills Kit Responder that lets you mock skill responses to your Echo and gives you the ability to rapidly validate your content. Learn more about Eric. John Wheeler is the creator of Flask-Ask, an Alexa Skills Kit Framework for Python that enables rapid skill development. He also created AlexaTutorial.com, a resource for leveling-up quickly with Flask-Ask and the Alexa Skills Kit. Learn more about John. Mark Carpenter has been publishing the ASK Dev Weekly newsletter since September 2015. He was the architect of the Alexa Project curriculum that is offered to Bloc bootcamp students. He publishes the Alexa Skill of the Day apps which surface one exemplary Alexa skill each day. Learn more about Mark. Sam Machin got started with Alexa at the BattleHack world finals in November 2015. He published several tutorials on GitHub to help teach others how to turn a RaspberryPi or a CHIP into an Alexa client with the Alexa Voice Service. His alexaweb project was the inspiration for Echosim.io. Learn more about Sam. Steven Arkonovich was an Alexa enthusiast from the very beginning, writing Alexa skills before there even was ASK. He developed a Ruby framework for quickly creating Alexa skills as web services. He is one of the most active contributors in the Alexa forums. Read more about Steven. Walter Quesada created a video course for Pluralsight that teaches the foundations of developing voice-enabled skills for Echo and building custom Alexa skills in C# and ASP.NET Web API. He also talked about Alexa skill development at numerous tech events. Learn more about Walter. There are many ways you can share educational and inspiring content about AVS and ASK with the Alexa community through your own blog or newsletter, open-source development tools, tutorials, videos or podcasts and social media. You can also organize local meetup groups for like-minded Alexa enthusiasts and developers. Engage with Alexa evangelists in our weekly live webinars and office hours, share your contributions in the Alexa developer forums, and tell us about your #AlexaDevStory on Twitter. We can’t wait to share more contributions from the Alexa community in the next round we’ll announce by the end of this year. Stay tuned!